Thom Yorke has a reputation for surprise performances at the most random of locations. During Glastonbury 2011, the Radiohead frontman spun records inside an abandoned airplane fuselage. A few years later, as Lollapalooza took place in Chicago, Yorke performed a surprise DJ set for an audience of just 30 at Leopallooza in Cornfield, England. Yorke once again threw fans for a loop on Sunday as he apparently played an unannounced acoustic set at a garden party in his hometown of Oxford. 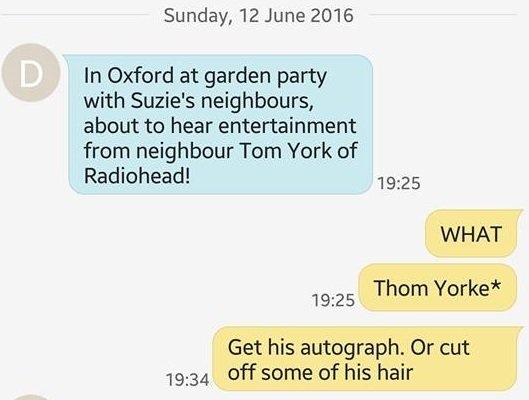 The news comes from reddit user verylittlesound, whose father attended the party and was unfamiliar with how to properly spell Thom Yorke’s name. According to verylittlesound, Yorke’s 30-minute performance include solo acoustic renditions of “Desert Island Disk”, “No Surprises”, “Street Spirit”, “Reckoner”, and “I Might Be Wrong”. As of yet, no video has surfaced, but the above photo is enough to have us Daydreaming. Update: We now have video of Yorke performing “Reckoner”.